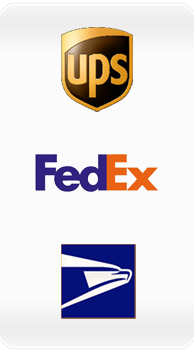 CommuniCart can connect directly to FedEx, UPS and USPS to get live shipping rate quotes. Live integration means you can pull your negotiated rates from the supported carriers and quote them for your customers. Get more sales and savee your customers money with CommuniCart. Design and Create your own shipping methods and rates. Name the shipping methods the way you want. Set shipping prices either by product (fix or free) or by invoice amount. You can offer free shipping on orders over a certain amount, by total shipping weight, by invoice amount and state of destination, by total shipping weight and state of destination, or by live, real shipping rates with prices directly retrieved from FedEx®, USPS®, and UPS® Online Tools. You can set up handling fees for selected products or for an entire order.